Delhi Dialogue – a group of individuals inspired by Dalai Lama teachings – gathered to discuss the impact of globalization on social well-being. Presentations of the organizations dealing with global problems like poverty, rural empowerment and education preceded teaching of His Holiness. Inspired by the teachings of His Holiness the Dalai Lama on compassion and interdependence, a diverse group of over 75 individuals and philanthropic groups from all over the world gathered here on last Friday to galvanize global impact on individual and communal well-being. Delhi Dialogue, the first of its kind that brought together big and small NGOs, is aimed at enabling humanitarian leaders to collaborate, network, and create pragmatic opportunities as well as to expand their impact and avoid duplication. Representatives of organisations working on critical global issues such as poverty, rural empowerment, education, conflict resolution, juvenile justice, and gender inequity made presentations before His Holiness requesting his suggestions and advice during the day-long event. His Holiness said many poor and marginalised people he has met over years often tend to display a sense of inferiority. He recalled a visit to a family in Soweto (South Africa) where a local teacher related to the family told him how the natives felt inferior. 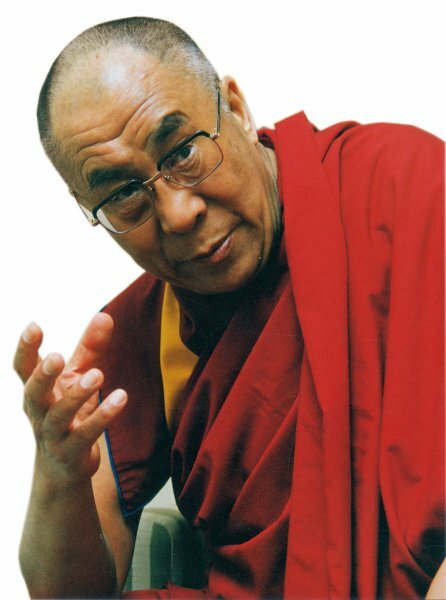 His Holiness said he told the teacher it was wrong to hold such attitude and that every human being has the same potential. “After a while, the teacher took a deep sigh and whispered to me that he understood what I said,” said His Holiness who has since then sponsored the education of the family’s three children. The children are now doing further studies with financial help provided by His Holiness. “Show more respect and give them self-confidence that they too are human beings with equal right to overcome sufferings,” he said. Former president of India, Dr APJ Abdul Kalam, who chaired a session with His Holiness on rural poverty shared his experience working on the PURA project, a sustainable development system that provides urban amenities in rural areas. Dr Kalam said the fact that 700 million Indians live in 600,000 villages makes it important to empower the rural areas for the over all development of India. Each PURA benefits 20 villages and so far 7,000 Puras have been established. Richard Moore, the Irishman who demonstrated a rare spirit of forgiveness by befriending the British soldier who blinded him talked about the work his organisation, Children in Crossfire, does in conflict-torn areas in Africa and Norther Ireland. His Holiness had called Moore “My Hero” during a public talk Moore gave at the Tibetan Children Village school in Dharamsala. “These days, in my hometown in Derry, people tease me calling me “Derry Lama,” Moore said leaving the audience in splits. Moore remembered a meeting His Holiness had with some long-suffering victims of state and paramilitary violence in Northern Ireland. He said the moment His Holiness walked in, the whole atmosphere changed. And a woman who had found it difficult to cope with the death of her husband by a proxy bomb finally told His Holiness, “You have released me to forgive the people who killed my husband,” Moore said. A common concern shared by the participants was the untimely closure of many NGOs within less than 10 years of existence even after making effective contributions. Some like Dr Fazal Abdel of BRAC (Bangladesh) suggested periodic overhaul of the system in areas of human resources and auditing in addition to time-tested values like determination and persistence to prevent immature burnout. An interesting outcome of the event was the commitment to build earthquake-proof schools in areas between Sichuan and Yushu provinces - both hit by deadly quakes in 2008 and 2010 that killed hundreds of schoolchildren, Mathieu Ricard, an eminent scientist and a Buddhist monk informed the gathering. One of the success stories shared by the participants was Joe Madiath’s Gram Vikas initiative that aims at reducing unnecessary drudgery borne by rural women in collecting firewood and fetching water as the key to increasing female enrollment in schools. When he first started his project in villages near Chandragiri in Orissa, less than 10 percent of women went to schools. The enrollment rate is now above 90 percent after facilities for water, electricity, and sanitation were provided. Some Tibetan refugees living in the vicinity have also benefitted from this project. And in Bangladesh, 200 schools run by BRAC outperformed many richer, high-quality private schools in last year’s exams. BRAC works primarily in the area of girl child education and has so far organised 8 million women from different villages. Prayas provides education, healthcare, and shelter some 35,000 street children in India. Founder-Director Mr Amod Kanth said much work needed to be done as 60 million children still do not go to school out of which 35 million live in extreme conditions exposed to various injustices including trafficking. Prayas has also organised exchange programmes with Tibetan children in Dharamsala. Craig Kielburger, founder of the Canada-based Free The Children, has built 650 schools for marginalised children. In partnership with the Vancouver-based Dalai Lama Center for Peace and Education, the organisation has created various programmes through which children raised funds for schools in Gansu, Sichuan, India, and Africa. Quoting His Holiness, Kielburger said the greatest challenge is not in fixing the challenges the world faces but in raising the children to care about these existing challenges. Bunker Roy’s Barefoot College employs an unique method to electrify villages - by training illiterate grandmothers, among them some Tibetans, to be solar engineers. Earlier this year in Dharamsala, Roy introduced His Holiness to two grandmothers who were to later become engineers. The NGO also works in Africa and Himalayan areas besides Rajasthan where it is located. The Canada-based Roots of Empathy fosters a sense of empathy among school children to arrest what founder Mary Gordon called “desertification of heart”. Gordon said developed countries with their modern education and highly advanced economies face large quantities of “emotional illiteracy”. By 2010, the impact of the organisation has grown to 300,000 students scattered all over North America and Europe. Other presenters were Leila Chiriyath Janah of Samasource, Saurav Adhikari of Shiv Nadar Foundation, Jeff Walker of Millenium Promise, Rev. Mpho Tutu of Tutu Institute for Prayer, Carolyn Miles of Save The Children, Peggy Dulany of Synergos, Zainab Salbi of Women for Women International, Barun Mohanty of Michael and Susan Dell Foundation, UNICEF, Jennifer Buffett of NoVo, Rajeev Mehrotra of Foundation for Universal Responsibility, Ruchira Gupta of Apne Aap, Mohammad Musa of CARE, and the Omidyar Network. Victor Chan, a Chinese-Canadian who co-authored Wisdom of Forgiveness with His Holiness hosted the event. Chan who has been a long-time friend of His Holiness is also the author of Tibet Handbook: A Pilgrimage Guide.